In this post, I shall comment on one of the oddest debates to resurface in recent years: the gun control debate. On one hand, it’s re-emergence is not surprising: we are all concerned about increasing our safety and well-being, which proponents of gun control claim their ideas will accomplish. But, the odd thing about this debate is that we have already seen gun control fail abominably; so, what’s the point of trying again to convince us of its merits? Convincing people of the merits of gun control is like trying to convince people of the merits of a zeppelin. A zeppelin works fine until–like in the case of the Hindenburg–a tiny spark sets all its hydrogen gas ablaze and sends all the crew and passengers falling to the certain death. Much better to stick with helium filled blimps! I used to follow the gun control debate religiously in the 90’s and early 2000’s until it died at some point in the Bush years. On one side, advocates of “reasonable firearms laws” wished to remove any gun they deemed dangerous from the hands of civilians through incremental restrictions and confiscations, such as the Assault Weapons Ban (really semiautomatic rifle ban). These gun control supporters wished all modern firearms in the hands of the police and the military. Here, I wish to point out that dictators throughout history have divested their subjects of arms so that they might more easily control them. The British government had people arguing for disarming American colonists before the Revolutionary War. After this country was formed, we have the example of the corrupt Tammany Hall of New York City trying to disarm its residents so that gangs owned by the politicians might have an easier time terrorizing their victims. This state of affairs, law-abiding citizens at the mercy of unscrupulous politicians and nefarious criminals, is where gun control eventually leads–even though proponents of gun control think removing guns will reduce crime in much the same way as Prohibitionists thought banning liquor would help public morals. On the other side of the debate, the National Rifle Association (to make my bias clear, I am a lifetime member of this proud organization) proposed tougher sentencing for criminals, tougher sentencing where a gun was used in the commission of a crime, a national instant check system to prevent sales to criminals, gun safety courses, gun training courses, and more states to offer concealed carry permits. Looking at the country now, with crime continually dropping even as firearms ownership increases and forty-four of the fifty states offering shall-issue concealed permits or unrestricted carry, one sees that the advocates of gun rights had won. I say “had won” because the debate has been stirred up again through recent mass shootings, and people have forgotten why advocates of gun rights won the debate. In the 90’s and the early 2000’s, tons of ink were spilled on the question of whether gun control lowered crime. Also, people studied defensive gun use vs. criminal gun use. I remember reading how the Brady Campaign (an anti-gun group) put forth the figure that firearms were used 270,000 times per year in self-defense. Though less than Gary Kleck’s estimate of 2.4 million times which he advanced at the same time, it was still over three times more than the 67,000 gun crimes per year committed in the late 90’s. Gary Kleck is famous for his book More Guns, Less Crime. He originally thought that his studies of the effects of Florida’s gun ownership and concealed carry laws would prove otherwise, i.e. more guns equal more crime; but the positive effect of gun ownership which he discovered in Florida caused him to become one of the nation’s greatest proponents of gun rights, especially concealed carry. Women are the largest growing segment of the firearms community–with good reason! Yet, studies like Kleck’s did not suffice to win the gun control debate. 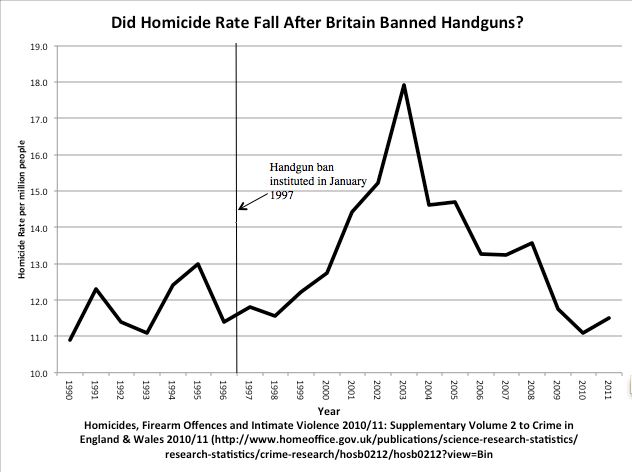 What crushed the gun control debate more effectively than any study was the enactment of the United Kingdom’s gun ban. This ban, covering such a wide range of firearms that it even included antiques, had a wholly negative effect on violent crime, which instantly skyrocketed in 1998 and kept increasing until 2003. Five years of rising crime! Admittedly, what may only be described as the pro-crime policies of the Labor Party did not help, but the combination of the ban and bad crime policies led to London becoming the crime capital of the Western World and Scotland its most violent country. Such is the legacy of gun control in the modern western nation closest in character to the United States of America. People have pointed out how Australia’s gun crime and even overall crime have lowered a little bit since its ban. But, one must remember that its ban was not as comprehensive as Great Britain’s: Australia limited its ban to certain kinds of semiautomatic and fully automatic rifles and shotguns, leaving manually operated firearms some semiautomatic pieces and various kinds of handguns in the hands of its citizens. It strikes one as more a set of restrictions than a firearms ban. Probably can’t own that in Australia, but I’m just guessing. Also, Australia did not divest its citizens of the right to self-defense, as Britain’s government did to its citizens. I used to read horror stories about how Englishmen were imprisoned or otherwise persecuted by their own government for defending themselves. An anonymous Englishman who lives in a rural area and still retains some guns once told a relative of mine that if someone broke into his house, he would kill the intruder, bury him, and not tell the police. And why should he? The British government has reduced its citizens to slaves on the point of self-defense. How quickly the right to self-defense went with the right to possess a firearm should be instructive to all concerned citizens. Despite that sad history, I met someone two years ago who contended that would should not judge the effect of gun control in America through the example of the United Kingdom. We are two separate countries and laws will affect each country differently. His response left me flabbergasted. My arguments to the effect that no other country is as close to us by language, culture, and history did not change his mind as to whether we might profit from their example. That crime in America has continued to fall through pro-gun measures did not convince him either. We cannot underestimate how greatly people who have not handled guns fear them. Their fear allows politicians to use propaganda to sway them to accept “reasonable gun laws.” Now, we have Hillary Clinton trying to sway such people to accept gun control with the eventual object of banning gun ownership–the unspoken goal behind the statists’ agenda. Patriots everywhere need to dust off old arguments against gun control and bring a few new ones to bear besides. Through doing so, we can lift our fellow citizens from an unreasoning fear of guns and dissuade them from the simplistic and false notion that restricting the lawful ownership of guns decreases crime. But, whatever we do, we must not neglect this duty. Let it not be said that America was disarmed because patriots slept!